Parathyroid Hormone-like Hormone is a relevant protein in the biology and treatment of several malignancies. A work in Nanomedicine, headed by Nanobioelectronics & Biosensors Group led by Prof. Arben Merkoçi from the Institut Català de Nanociència i Nanotecnologia (ICN2) and by Dr. Carmen de Torres Gomez-Pallete group from the Fundació and Hospital Sant Joan de Déu, describes for the first time the application of lateral-flow immunoassays for the detection of this protein taking advantage of paper based nanobiosensors properties. Parathyroid Hormone-like Hormone (PTHLH) is a secreted factor that is present in virtually all organs and tissues of the body. In cancer, it has been reported to be involved in the initiation, survival and progression of primary tumours, as well as in the generation and development of metastases. Nevertheless, the mechanisms that control its production and secretion are not completely understood, partly due to the lack of specific, sensitive and easy techniques to detect and quantify this molecule in in vitro models. The available methods such as radioactive assays, quantitative reverse transcriptase polymerase chain reaction (qRT-PCR), Western blot or ELISA are expensive, time-consuming and require trained personnel. An article published online in Nanomedicine:NBM, by researchers from the Institut Català de Nanociència i Nanotecnologia (ICN2) and the Hospital Sant Joan de Déu, suggests a new simple, rapid, low cost, specific and long lasting method to detect PTHLH. The developed device is similar to a pregnancy test (Lateral-flow immunoassays) involving Gold Nanoparticles. In lateral-flow immunoassays, all the reagents are preloaded in paper strips, the samples are casted on a pad of the strip and flow by capillarity through all the components, mixing with the reagents and reaching the detection zones. As a result, the assay is done by just adding the sample on the corresponding pad, and adding washing solution afterwards. Finally, qualitative results can be read by naked eye and, in case that quantification is required, only a simple colorimetric reader is needed. In addition to the pregnancy test, lateral-flow immunoassays have been extensively applied for the detection of different analytes such as cancer biomarkers, DNA, toxins and metals. 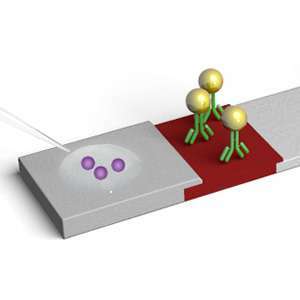 This is the first time that lateral-flow immunoassays has been applied for the detection of PTHLH taking advantage of the properties that paper based nanobiosensors offer (easy to use, quick tests, good sensitivity). It gives the possibility of quantifying PTHLH from a sample in less than one hour. Furthermore, this kind of paper-based diagnostics are suitable for largescale production, making them a very cheap and efficient technology.